Today, crews are grinding out the old asphalt on 8th and 9th Streets between D and E Avenue, and a portion of 7th Street between C and D Avenues. The grinding crew is expected to complete their work today, possibly working as late as 8 p.m. The grinding operation can be messy, as the asphalt is removed and the rough subgrade of the road is exposed. It is not pleasant to drive on and could become quite muddy – these roads will be closed 24/7 until final paving is complete later this week. 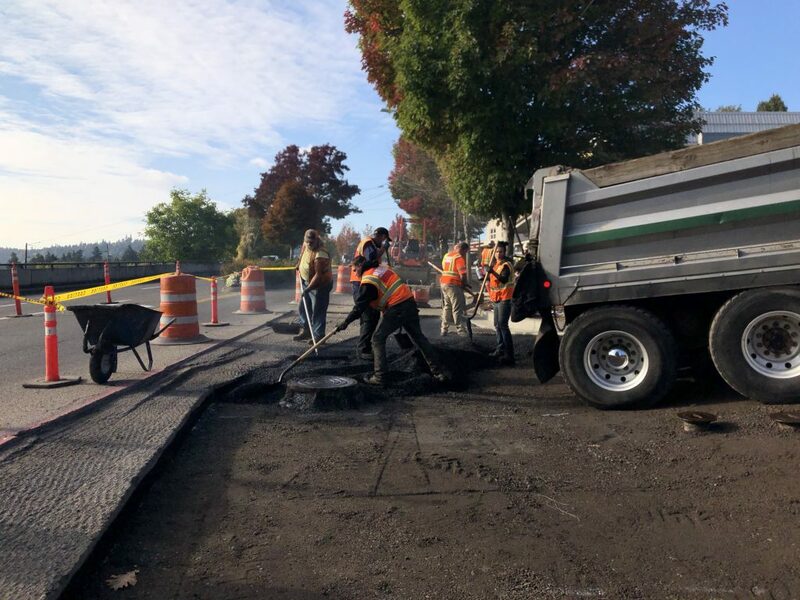 On Wednesday, October 10, through Friday, October 12, crews expect to place the final layer of asphalt along the entire ten blocks of D Avenue. Additionally, crews will place 5” of new asphalt in two lifts on 8th and 9th Streets between D and E Avenues, 7th Street mid-block between C and D Avenues, and a small portion of 1st Street near D Avenue. During the grinding and paving work, 7th, 8th, 9th and 1st Streets will be closed to all traffic, so the new asphalt can completely cure. 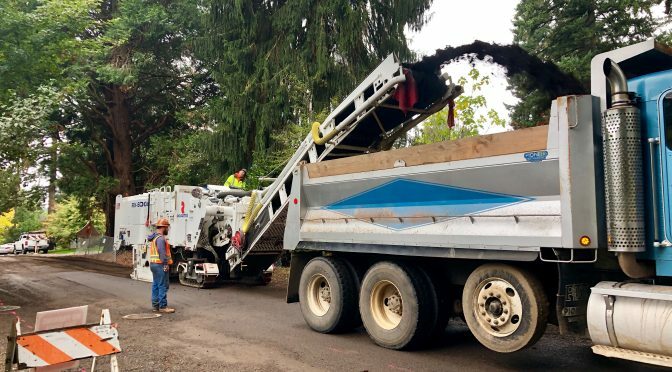 There will be no on-street parking on the streets to be paved – while it is always a last resort, cars will be towed if necessary to keep the paving crews moving. Resident driveway access on these streets will be blocked. Alley access will be closed at D Avenue – please use E or C Avenues. 1st, 7th, 8th and 9th Streets, and D Avenue are expected to be back open to traffic the day after the final lift of asphalt is placed. Neighbors should expect an increase in noise and vibration during the paving preparation and placement. Crews will be using a vibratory roller to compact the rock and newly placed asphalt, which creates vibration. This is a standard piece of equipment that is used throughout the paving industry. Due to unforeseen circumstances, the State Street lane closure was extended through this morning to allow the new pedestrian ramps time to cure and pavement to cool. Good news – the lane is now back open. Thank you to everyone for your patience during this temporary closure. D Avenue between State and 1st Street remains closed through early next week while crews finish installing catch basins and prepare for final paving. Crews have started pouring new sidewalk along portions of D Avenue. Concrete crews are currently pouring sidewalk near 8th Street, working their way east. Check out this video of crews pouring new sidewalk last week on D Avenue in between 4th and 5th Street. New sidewalk will be poured on the north side of D Avenue between 10th and 5th Streets, and on the south side of D Avenue from 5th to State Street. This work is expected continue through this month. When the forms are placed for the new sidewalk and the concrete is poured, nearby alleys and driveways will be barricaded and closed at D Avenue to allow the concrete time to cure. During this time, residents who take driveway access on D Avenue will need to park on a side street. If you need to enter or exit the alleys, please use E Avenue or C Avenue. To ensure garbage collection is maintained, sidewalk pours across the alleys will be coordinated with Republic Services’ schedule. If you live on D Avenue and your driveway will be impacted, you will receive a door hanger notifying you of the upcoming closure dates. Please plan to move your car(s) out of the driveway before 7 a.m. on the day the forms are installed, and park on nearby a side street until the concrete has cured.